Aberdeen players celebrating after Bruce Anderson equalises at Pittodrie in August 2018. Picture by Darrell Benns. Tomorrow’s crunch between Aberdeen and Rangers could go a long way to deciding who wins this year’s Scottish Premiership. Celtic are firmly in the driving seat of course, they’re six points ahead of Rangers and eight ahead of Aberdeen, but with 14 fixtures still to play the championship is still very much up for grabs. But a defeat here for either side would be a hammer blow to their title credentials. Particularly Rangers, whose supporters were on cloud nine after their New Year win over Celtic brought them level with their arch-rivals on points. A 2-1 loss at Kilmarnock brought them back down to earth and if the Dons can inflict similar damage on them, it could be too much to fight back from. Aberdeen manager Derek McInnes has been at pains to emphasise that he doesn’t see his team as being in the title race but whether that is his true belief or not, he would dearly love to get a win over the club he played with for five years between 1995 and 2000. It’s all set up for a cracker at Pittodrie and as the history books have shown us, those haven’t been in short supply when these two sides meet. Let’s take a look back at some of the memorable encounters between the teams in the Granite City. Rangers needed just a point from the second last match of the 1986-1987 season, which was Graeme Souness’s first at the club. It looked like going pear-shaped for the visitors as their player-manager was red-carded during a stormy first half for two brutal challenges. Rangers took the lead through Terry Butcher but the Dons equalised before half-time with a close-range strike from Brian Irvine. 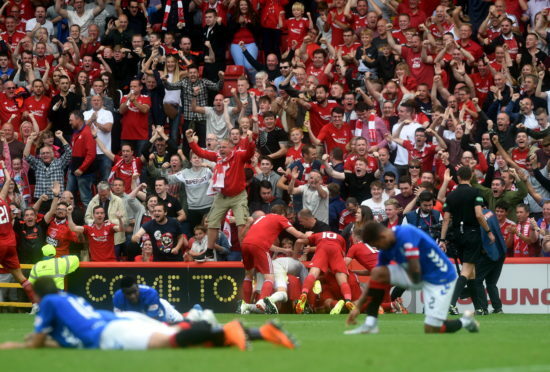 The Dons laid siege to the Rangers goal but the 10-man Gers held on to clinch their first league title in nine years. This one is best remembered for a shocking challenge from Aberdeen’s Neil Simpson on Ian Durrant which left the young Rangers midfielder with serious cruciate ligament damage. 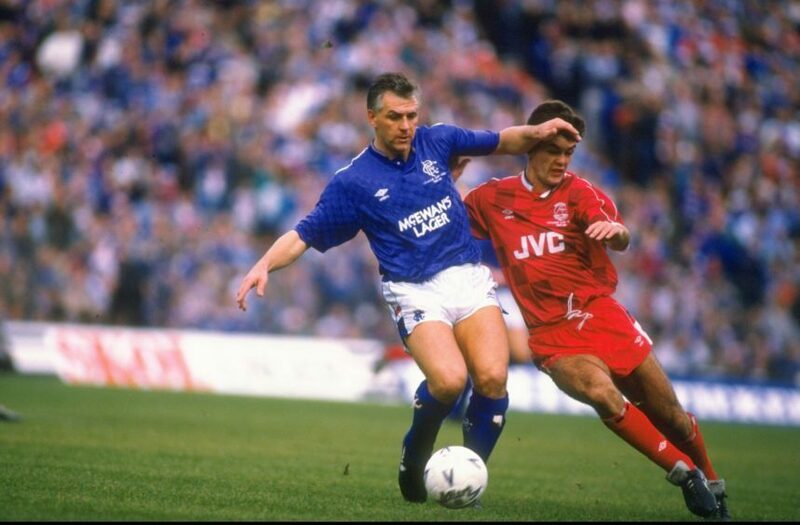 It took three years for Durrant to fully recover from the tackle and it is widely accepted that he was never able to reach the heights his early promise suggested after the injury. 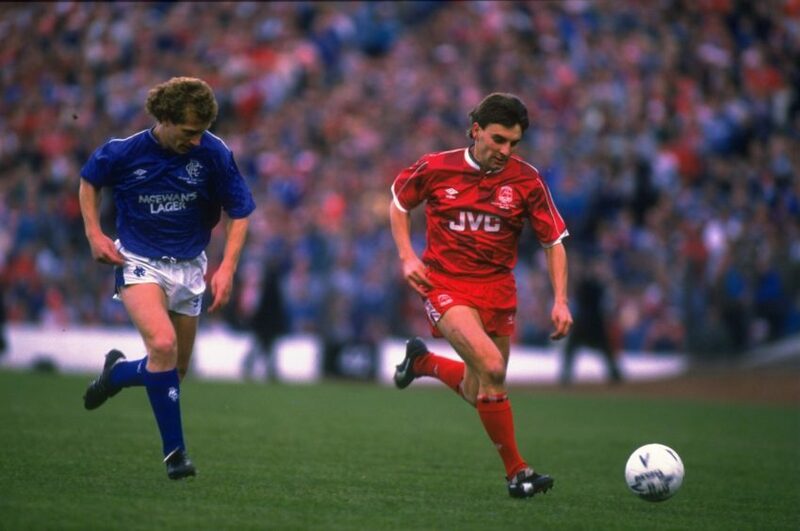 Away from the nasty side of the match, an early Neale Cooper goal for Rangers on his return to Aberdeen was cancelled out by a Jim Bett penalty. In front of a packed Pittodrie, buoyed by watching their team on a long unbeaten run, Charlie Nicholas nodded the winner past Chris Woods five minutes from time. This match was ultimately decided by a wonder goal from Rangers’ Italian defender Lorenzo Amoruso, but that superb strike is not the reason it makes this list. Instead it’s the fact that Dons striker Robbie Winters was hit by a coin thrown from the Rangers supporters’ enclosure. It prompted home fans to invade the pitch to confront Rangers supporters and the match ended up being halted for 17 minutes as riot police were called in to get the situation under control. Steve Lovell is mobbed by teammates and fans after his goal in 2007. Celtic had the title wrapped up ahead of second-placed Rangers so it was Aberdeen who had something riding on this one as they chased down a place in Europe. Scott Severin opened the scoring with a 30-yard screamer before Steve Lovell added a second to spark wild celebrations at Pittodrie. The following season, the Dons enjoyed their best European run since the 1980s by qualifying for the UEFA Cup knockout stages before eventually losing to Bayern. Aberdeen striker Lee Miller heads the opening goal for Aberdeen aginst Rangers at Pittodrie. Picture: Raymond Besant. If you can’t get your hands on silverware yourself, the next best thing is stopping your rivals from doing so. The Dons were well out of the title mix in 2008 but Rangers were level on points with Celtic with an inferior goal difference going into this final-day shootout. Jamie Langfield was in fine form in the home goal while goals from Lee Miller and Darren Mackie clinched a 2-0 win and ended the Gers title hopes. Tired Rangers had crammed a lot of football into the 2007-8 season after an impressive run to the UEFA Cup final and it appeared their exertions had finally caught up with them. Zenit had won that major final a week earlier and Rangers’ misery was compounded at Pittodrie with this defeat, as Nacho Novo was dismissed for a lunge on Stuart Duff. Alfredo Morelos is red-carded for an off the ball incident with Scott McKenna. The two sides were back jostling each other at the top of the table in 2017-18 and the concomitant rivalry took on a new dimension. Derek McInnes’s protracted will he-won’t he move to Rangers as manager was finally resolved – and boy, did Rangers ever take it well – and Ryan Jack’s move across the divide added some extra spice to an already heated atmosphere. Steven Gerrard’s arrival as the new Rangers man got things off to a flyer in 2018-19 and among Alfredo Morelos’ red card – which was later rescinded – for a kick at Scott McKenna and Stevie May pole-axing ex-Dons skipper Jack, there was a game of football here. 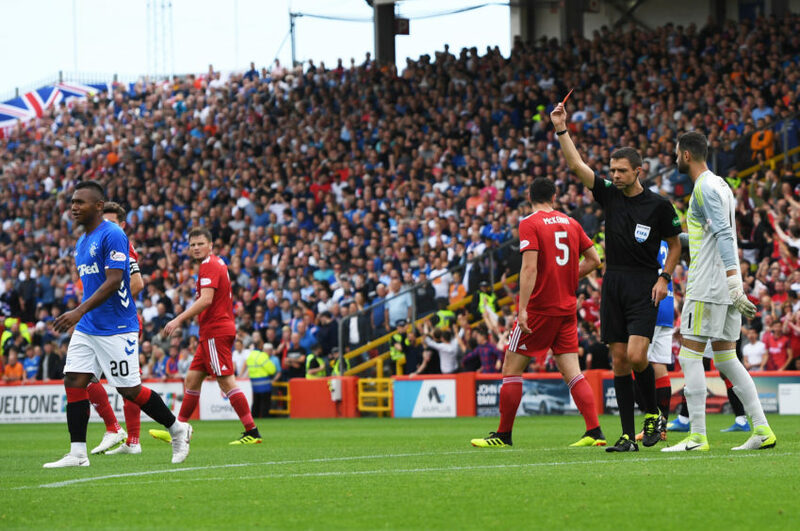 Rangers put on a dominant display despite playing most of the match with 10 men but it was Aberdeen who left on a high after Bruce Anderson’s stoppage-time equaliser.